Today we are going to take a look at the click funnel founder, Russell Brunson. Who is this guy? and how did he get to where he is today? Russell Brunson is one of the most innovative digital marketers of this generation, but what is so special about what he has created? At the end of this article, you can watch a webinar which shows you exactly how Russell makes $17,947 a day, with just one of his funnels! It should be noted that originally, Russell co-founded clickfunnels with two other digital gurus, their names are Todd Dickerson and Dylan Jones. As of today the clickfunnels website lists only Russell and Todd as the founders of the business. Russell Brunson co-founded click funnels in 2014, the company name is actually called Etison LLC, clickfunnels is the brand name of the software itself. Click funnels is different to alot of start ups in the tech space, they have managed to grow at a rapid pace without any venture capital. Avoiding venture capital is a part of their mission statement, they want to be different from the rest. By self funding, the click funnel founders keep full control and ensure their company ethos remains unchanged. I’ll explain exactly how clickfunnels works later in the article, but first we are going to delve deeper into the background story of the click funnel founder. How he come up with such an innovative piece of software? It all started back in college, Russell wanted to sell products online and the first product ended up being a DVD teaching people to make potato guns. The customer would pay $27 for the DVD, and it was quite successful, he was selling around $2000 worth of DVD’s on a monthly basis. At the time, Russell had no idea that this simple informational product would lead to him onto creating an inc 500 company. To sell the DVD’s, Russell would run google ads to target people with an interest in making potato guns. It worked really well at first, but then google started to up the price of the ads, and after some time it became unprofitable. At the time Russell didn’t know it but google had just given him the idea to build his first ever sales funnel. Previously Russell had met these two guys in northern Idaho, they drop shipped ready made potato guns! Russell got back in contact, he figured that his customers would definitely be interested in their ready made potato guns, and this became his first ever upsell. I’ll explain how it worked, customers would find Russell’s google ad, leading them to his potato gun DVD’s, the DVD’s would be offered to the customer in the front end of the funnel. Then in the backend, the customer would be offered the ready made potato gun, for every potato gun sold, Russell would make an affiliate commission and that’s how his google adword campaigns became profitable again. Russell’s potato gun success got people talking, within a year of graduating Russell had made $1,000,000 in gross sales. Without realizing it Russell had become very good at building sales funnels, so he decided to create a piece of software to allow other people to build out their own sales funnels. The success of clickfunnels isn’t down to Russell’s obsession with selling products, it has come with Russell’s obsession with consumer behavior. From the age of 12, he had a pretty strange obsession, he loved junk mail, yep that’s right he loved to collect all the marketing spam that was sent in the post. He loved it so much, he would opt in to every postal offer he could get his hands on, he begun to study the art and science of direct response marketing. Click funnels is now the fastest growing, non venture backed software company in the world, he has a cult like following of over one million entrepreneurs. One of the coolest things about clickfunnels is their exclusive members club called the “2 comma club”. This year, Russell’s training and software has created over 206 funnel millionaires, each of which are now members of the exclusive 2 comma club. To be part of the 2 comma club you are going to need to make over $1,000,000 with one funnel, hence the two commas. Once you surpass the $1 million mark, Russell’s team will send you a super cool, golden plaque. I know what your thinking and i agree, that’s insane! How is Russell Brunson Different? What makes the click funnel founder so different? Well, Silicone Valley is well known for being a melting pot of start up companies. Everyday entrepreneurs are trying everything possible to get the attention of venture capital firms. Why? Well, they want funding! For most companies, if you want to get your product/service out there you are going to require a big marketing budget, as well as a water tight sales strategy, this was the last thing Russell Brunson wanted! Russell lives and breaths digital marketing, and he practices what he preaches, in an interview with mixergy he reveals how clickfunnels was profitable from day one. Clickfunnels is completely self funded, the founders felt that working with venture capitalists would effect the fundamentals of their company ethos. If you are going to grow a company without venture capital, your product’s need to be wildly profitable and that’s exactly what Russell did. 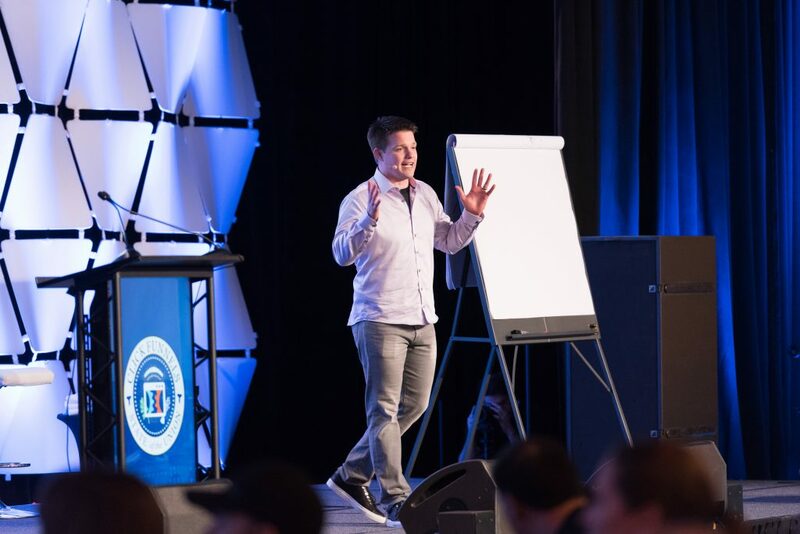 The click funnel founder has a huge competitive advantage, you can’t buy Russell Brunson, his roots run deeply into the internet marketing space. He lives and breathes the analytical side of things, and this is why clickfunnels is so good. Russell Brunson’s ability to scrutinize sales copy, sky rocket conversions and understand customer behaviour has allowed him to make millions, building his own sales funnels. By creating clickfunnels, Russell has allowed other people to benefit from his expertise. Inside clickfunnels, Russell runs free training webinars, every hour of every day. My favorite webinar to date involves him showing you how one of his “weird niche funnel’s” makes him $17,947 a DAY!…. A DAY! WAIT WHAT?! I know, it’s completely insane and that is just with one funnel! Watch the webinar and you’ll see what i mean. If the click funnel founder can do this with one funnel, how much money is he making every day? He truly is a fascinating entrepreneur! I have read both of Russell Brunson’s books, i heard about them within a digital marketing facebook group. Russell’s first book, DotComSecrets was the first marketing book i fell in love with. I liked DotComSecrets so much, i have written a mini book review, have a read and let me know what you think. If you are struggling with traffic or conversions it’s well worth a read, it almost forces you to rethink your whole business process. The book is seriously good, i mean after all it did hit the Amazon and USA Today, best selling book lists. So he is a best selling author too? Is there anything this guy doesn’t do? I then went onto read Expert Secrets now i haven’t got round to writing a review on this one yet but again, i loved it! This book can help you become an “Expert”, it will then show you how you can create a mass movement of people that will pay for your advice, that’s the dream right? Well, the book outlines exactly what Russell has done with clickfunnels, he has a cult like following of over 1,000,000 entrepeneurs. It really is an excellent book, both are well worth reading especially if you are interested in building an online business. Like many entrepeneurs, Russell Brunson solves problem’s for his followers, he solves their problems by providing a software solution (clickfunnels). The software has been incredibly successful for the click funnel founder and it’s user’s, but what sort of figures are we talking here? The following statistics will blow your mind (Please note, these figures have been taken from the income disclosure on the clickfunnels website. As mentioned earlier, clickfunnels has a couple of exclusive clubs, the 2 comma club and the 3 comma club, but what sort of revenue are click funnels users bringing in? and 0.67% (thats over 350 clickfunnel users) have made more than $1,000,000 in revenue. Anyway, i hope you have enjoyed this article, do you use click funnels? or are you thinking about using it?